After a scorching weekend that saw the hottest Father's Day in more than 20 years, potentially dangerous temperatures continued into Monday. Susan Carlson reports. The heat isn't over yet. After a scorching weekend that saw the hottest Father's Day in more than 20 years, potentially dangerous temperatures continued into Monday. Cook County was under an Excessive Heat Warning through 7 p.m. Monday night, according to the National Weather Service. The NWS warned that temperatures in the 90s could feel like they're reaching between 100 and 105 degrees, and heat illnesses will continue to be possible. The Chicago area is bracing for a weekend heat wave that could be dangerous. Michelle Relerford reports. “The extended duration of heat, combined with nearly full sunshine, and oppressive warmth at night will lead to hazardous conditions, particularly for the elderly and those with pre-existing health conditions,” the alert reads. Residents are advised to drink plenty of fluids, stay in air-conditioned rooms and stay out of the sun. The heat will be particularly dangerous for elderly residents or those with pre-existing health conditions. Residents can call 311 for well-being checks and cooling centers will be open at multiple locations around the city. 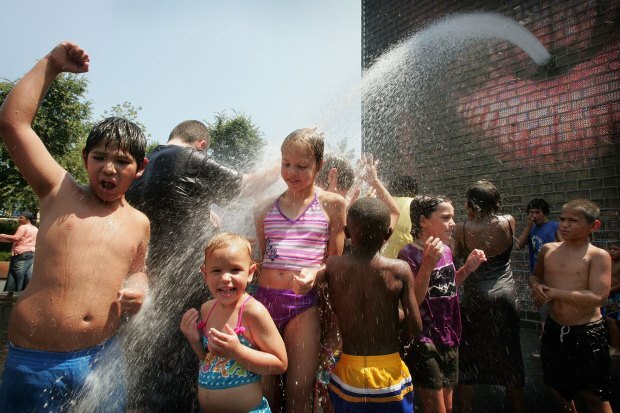 Chicagoans should also remember the signs of excessive heat exposure. People suffering from heat exposure may get dizzy and sweat excessively, but those with heat stroke don't sweat at all. Heat stroke may come with a throbbing headache or a rapid pulse, symptoms that may sneak up, so it's important to know the difference.